October 14, 15 & 16 1965. GP wrote: “I became interested in Thomas More’s portrait some years ago at the Holbein Exhibition at the National Gallery. It showed a man of integrity and understanding, a man with his feet on firm ground, when most of his contemporaries seemed to be afloat and uncertain. One could see it in the eyes. The Common Man in Robert Bolt’s play prides himself on being able to ‘touch bottom’ and watch his main chance. He is a symptom of the times, a fellow traveller looking after No.1 with a sort of cunning and sense of self-preservation. Perhaps most of the common people were like that. With More, that great man, it is different. He could not help loving Trust more than family and self. He stood against the current of the times because his intellect raised him above his fellows, who changed to suit every shift of Henry VIII’s passions. 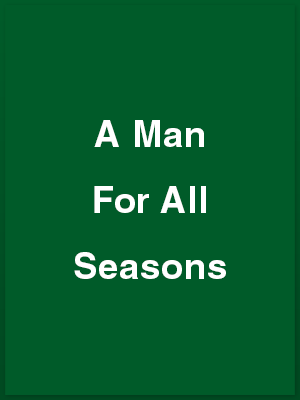 The seasons found him constant but in his breadth of character he was, surely a man to relish all seasons. THE Sussex Full-Length Drama Festival opened on a promising note at Barn Hall, Southwick, with Wick Theatre Company’s impressive production of A Man for All Seasons, by Robert Bolt. There was an adjudication on Friday by Jane Benson and the last of the four crowded performances was on Saturday. George Porter’s guiding hand as producer made its impact felt throughout, and the large cast caught the very essence of this troubled period of English history, around 1530, when king Henry VIII crossed swords with the church over his intended marriage to Anne Boleyn. Enhance by skillfully contrived settings which frequently changed without recourse to the use of the curtains, by beautiful costumes, and a cast obviously well rehearsed, the production set a high standard. As the adjudicator said on the third night, most of the cast had grasped the essentials of their characters, the flow of the sequences was good, as was the teamwork, and the pace well maintained. It was Patrick Johnson, as Sir Thomas More, the Lord chancellor whose integrity led him to the chopping block, who so admirably carried the heaviest acting burden. He displayed a rare sensitivity to the great demands of his rôle. Another fine character study was that of Nikki Leroy as Cardinal Wolsey, and Brian Moulton’s King Henry was splendidly robust. David Goodger successfully played that arch opportunist, Richard Rich, and David Creedon as the Common Man, frequently taking the audience into his confidence, was a fascinating 16th century ‘fellow traveller’. There were impressive performances by Barry Bowen as the Duke of Norfolk, Ralph Dawes as Thomas Cromwell, Wilfred Perkins as the Spanish Ambassador, Peter Power as Archbishop Cranmer and Peter Elson as William Roper. Only three women were in the cast, but they made their presence felt and acted with telling conviction. Angela Bolton’s study of Alice More, Sir Thomas’s wife, was roundly satisfying, and Fay Sturt please as Margaret, their daughter. Ably completing the company were Pru Thompson and Peter Joyce. There were several new faces which augurs well for the future. Morfydd Bowen, Bess Blagden and Nikki Leroy are to be congratulated on the costumes and properties, and others assisting were Margaret Perrett, Ian Elliott, Frank Hurrell, Norman Hutchins and Terry Mace. Southwick Players’ entry in the Festival will be A Letter from the General, by Maurice McLoughlin, at the Barn from November 2 – 6. NO criticism that may emerge in this review should obscure the fact that the Wick Theatre Company’s presentation of A Man for All Seasons last week-end was very good indeed. Here is a play of quality and technical brilliance. It is Robert Bolt at his best and with every part a difficult one. Despite the importance of the supporting cast, the play must depend on the actor who plays Sir Thomas More, and it would be only in minute detail that Pat Johnson could be faulted. There were, indeed, moments of brilliance, and that most poignantly in my mind was when he was visited in prison by his daughter and his second wife. King Henry VIII was finely played by Brian Moulton. The lighting changes of mood, the sudden emergence of the artist, the sudden emergence of the lustful king were all cleverly done. David Goodger scored, too, as the self-seeking Richard Rich, driven even to perjury by his overweening ambition. Thomas Cromwell gave to Ralph Dawes an opportunity to show overt villainy which he grasped firmly. Wilfred Perkins, of the Woodingdean Players, as the Spanish Ambassador, gave another of the more keenly observed characterisations, so charming, so pious, so insidious. The Common Man, the narrator, the player of many small parts, was not well served by David Creedon. The use of his Irish accent and his manner of playing the rôle tended to make the Common Man a character in his own right and an obtrusive one. The Duke of Norfolk, torn between his admiration for Thomas More, the power of the king, and the sheer inevitability of much of the events was well played by Barry Bowen. Peter Elson was the rather rough and self-opinionated William Roper, Archbishop Cranmer was played by Peter Power and an attendant on the Spanish Ambassador by Peter Joyce. Cardinal Wolsey was played by Brighton Theatrical costumier Nikki Leroy; a clear-cut and incisive performance, but I should have better liked a more “oily” and more comfortable Cardinal. This is essentially a play dominated by men, the ladies of the cast having few opportunities. Angela Bolton did well a Thomas More’s wife, Alice. His daughter Margaret was very charming Fay Sturt and Pru Thompson was a woman brought in as supposed evidence of More’s turpitude. George Porter’s direction of this play showed his clear understanding of the issues involved; and to say this is to say everything. Every detail was slanted to present a true picture of Thomas More. With its rapidly changing scenes, this play needs stage management of a high order, and Ian Elliott is to be congratulated. WHEN it comes to portraying some of the dark dramas which lurk in the pages of early English history, the Wick Theatre Company can be relied on to give amateur performances which rank with the best. This true of the triple presentations at the weekend of Robert Bolt’s A Man for All Seasons at the Barn Theatre, Southwick. Revolving round the commandingly aloof figure of Sir Thomas More, played by Pat Johnson, whose pale, ascetic face bore an uncanny resemblance to the 16th century statesman and author, the splendidly costumed and staged production was directed by George Porter, who made a study of the one-time Lord Chancellor. This assessment was justified by Patrick Johnson during his splendid portrayal of the great man who, at loggerheads with the passionate whims of King Henry Vlll – given a powerful interpretation by Brian Moulton – met execution in the Tower for his religious convictions and disapproval of his monarch’s matrimonial connivings. The commonsense comments of The Common Man were given rich humour by David Creedon, whose wicker basket of alternative costumes stayed on stage as happily as the very real stone pillars and archways, through which one glimpsed a diversity of backcloths. David Goodger was excellent as the slippery customer, Richard Rich – a man who knew no truth when faced with bribery. Angela Bolton and Fay Sturt, charmingly gowned and finely cast, gave Sir Thomas both love and support as his devoted wife Alice, and gifted daughter, Margaret. Nikki Leroy, scarlet-robed and impatient of political thwarting, presented Cardinal Wolsey with keen insight, and Ralph Dawes gave a sound portrayal of Thomas Cromwell, who rose to become Earl of Essex and ended with his head on the block.